The ALritma X self-adhesive labeller sets itself apart with its extraordinary capacity, working time, precision and speed. Despite its compact size, ALritma X is equipped with a larger unwind unit (400 mm diameter), coupled to a powerful rewinder unit to provide longer running times and reduced downtime. Thanks to its powerful stepper motor, it can reach label supply rates of 40 m/min, and is available for 100 and 200 mm label widths. 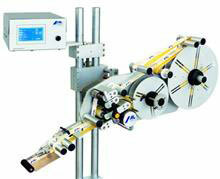 The most sophisticated version of ALritma X – equipped with a “High-performance” kit composed of a motorised rewinder unit for the silicone paper and innovative “push-pull” label web drive system – offers speeds of 90 m/min at a rate of 900 labels/minute; despite this incredible performance, high levels of positioning accuracy are maintained, even when the product transport speed is varied. This configuration is particularly well suited to rotary labellers and applications requiring the use of printers/markers and corresponding detector checks. Compact control box with touchscreen interface. Z4700 system conforms to the ergonomic & design tradition of Zanasi. You can count on our Award Winning Sales and Service for end-of-the-line automated coding and labeling solutions for every industry.